Miss Tyler again explores family connections in terms of compensatory stress and balances, necessary exclusions, and the loneliness of outsiders resisting absorption. Mrs. Emerson is the vortex of the Baltimore Emerson family, a widow "wearing pastels, holding out smooth white hands with polished nails," to receive her intermittently returning seven children whom she controls with charged verbiage: "Oh, everything she said nowadays was attached to other things by long gluey strands. . . touching off chords, opening doors." College drop-out Elizabeth comes into the echoing Emerson house -- open, easygoing, attracted to the welter of disconnections as only an uncommitted drifter, with an urge to heal, can be. She becomes Mrs. Emerson's handyman (a chic conversation piece) and is bumblingly courted by sons Timothy and Matthew, who, like the other Emersons, are irresistibly drawn to a fixer and a patcher. 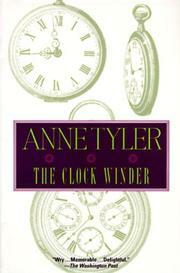 But Timothy commits suicide, and Elizabeth, blaming herself, leaves for her own home where the clocks all run on time and no one needs or wants feelings which cannot be prepared ahead and frozen. Elizabeth slips away from marriage at the last minute and is on her way to some kind of freedom when the Emersons, rallied around Mrs. Emerson and her recent stroke, lure her back. Her new name becomes "Gillespie" (the result of Mrs. Emerson's impaired speech) and with relentless family pressure, including a murder attempt by an unstable son Andrew, Elizabeth's fate is sealed as ultimate handyman in a family "closed around nothing. . . all huddled up together scared to go out." Another gently insidious exposure of the adders under the veranda.